If the spaces we inhabit tell a lot about us, this must be true also for the office of Can Dündar, journalist and chief editor of Turkish newspaper Cuhmuriyet (Republic): the huge pile of unopened correspondence, the myriad of handwritten notes spread out over every centimetre of available space, the shelf full of literary and journalism awards. "I will receive one in Italy too, next July", he said, referring to the Ischia Prize for Journalism 2016. Behind his desk hangs a poster, also present at the entrance of the building, with dozens of photos of the editorial staff members. After the scandal, all his colleagues signed a message of solidarity, all declaring themselves responsible for what had been published. Dündar and his colleague Erdem Gül rose to international publicity after writing an article exposing the arm trafficking activities run by the Turkish secret services on the border with Syria. The two have been prosecuted , partly as a result of direct intervention by President Recep Tayyip Erdoğan, who personally filed a complaint to the judiciary: "I repeatedly thanked the President for bringing my case to such publicity". The charges against Dündar and Gül were heavy: propaganda in favour of terrorism, military and political espionage, state secret disclosure and fabrication of false news – enough to get more than a life sentence. Preventively detained last November in view of the trial, the two journalists were released in February, when the Constitutional Court declared that the arrest violated their rights to freedom of expression and their personal safety. In the first stage of the trial, which ended on May 6th, Dündar and Gül were sentenced respectively to 5 years and 10 months and 5 years in prison for state secret revelation, with all other charges dropped. They are now, pending appeal, and the court lifted a travel ban against them. "Life in prison was hard, not only as a man but also as a journalist. New to the isolation, I took the opportunity to write my book on the matter" (titled "Tutuklandık", "We were arrested"). Dündar does not at all regret writing that piece: according to him, this story had to be published, as it shows Turkey's deep involvement in the Syrian war and proves the passage of arms across the border, which, he stresses, "is an international crime. Bringing the matter to the attention of the public, by exposing Turkey's support to militant jihadism in Syria, was critical to try to slow the progressive involvement of Turkey in the conflict in which it still risks to be dragged". After release, life has certainly improved, but problems did not end. "Now every day I have hearings with the prosecutors, I receive requests to appear in court, where I spend almost more time than in the newsroom. I'm not the only one of course, even today three other colleagues will be arrested", he says referring to Erol Önderoğlu (journalist of the Bianet portal and country representative of Reporters Without Borders), Şebnem Korur Fincancı (human rights activist and president of the Human Rights Foundation in Turkey), and Ahmet Nesin (freelance writer and journalist). The day before the ruling, Dündar was also attacked outside the courtroom, when a man fired several shots at him before being immobilised – an act of intimidation rather than a real murder attempt, as pointed out by the journalist himself, who was unhurt and now lives under guard, a situation he cannot get used to: "Imagine doing your job as a journalist, going to meetings and interviews with six men always around you, like a politician. It is certainly not the best situation to work serenely. I often wonder whether these men are here to protect me or watch me". Between January and March 2016, 49 journalists were detained in Turkey. In the Resource Centre on Media Freedom, further information can be found on the pressures and different forms of intimidation against journalism in Turkey. Among these, quarterly reports by Bianet and related infographics highlight specific cases involving journalists on trial and imprisoned in Turkey. Dündar is convinced that the international support he received was crucial for his release. "Without international mobilisation exerting pressure on the Turkish institutions I would still be in prison. This mobilisation and this pressure should not stop: there are still 35 journalists in prison who need all our support. We have to write about them, give visibility to them and the stories they tell". Dündar considers it essential for journalists, lawyers, and civil activists to attend trials against journalists, as it is important to build a transnational dimension of journalism. "Today you are here with me to talk about Turkey, tomorrow I could be in Azerbaijan to document cases of corruption of the president of that country". This helps overcome the authorities' attempts to silence the media, as it is easier for the State to go after its own citizens than a foreigner. "I believe that Turkey is going through its darkest period, journalism-wise. It has never been an easy country for journalists, but I think today it has reached its lowest point and is experiencing unprecedented repression". The figure of Dündar has obviously polarised the public opinion. Alongside many expressions of support, the reporter also experienced attacks on his person and his professional integrity and was repeatedly called a traitor and a terrorist – a term that recurs obsessively in public communication in Turkey and beyond. A term every journalist must deal with: "In Turkey there are at least 20 million of us terrorists, we are the country with the highest percentage of terrorists in Europe. This is because Erdoğan uses the excuse of terrorism to attack any opposition. I was called a terrorist and a spy, but I also learned not to care. Terrorism is a subjective word that needs a more specific definition. In particular, Turkey's anti-terrorism law must be changed, because the government is exploiting it for its own political purposes". Dündar is not shy about Erdoğan's presidential reform project and his dream of a New Turkey: "If we let him, Erdogan has the power to push the country towards fascism. The over 2,000 defamation complaints reveal the size of his ego and the untouchability of his figure as central to his political project. It is a manipulation which serves to protect him from criticism and punish the opposition. It is our duty to resist this authoritarian drift". According to Dündar, Erdoğan has given ample proof of his authoritarian nature also on the international scene, especially in relations with Europe, that "unfortunately has been ready not only to tolerate, but also to accept the political scene in Turkey in order to find a agreement on the issue of refugees, turning a blind eye on what is happening in this country". An attitude that "is a real tragedy for supporters of democracy in Turkey". The journalist is certain that EU membership remains the dream of every democratic citizen of Turkey and it is therefore important that Europe should not give up this opportunity to offer and insist on negotiations, in particular those concerning civil liberties. Yet, it should also understand that "Erdoğan is not ready to accept constraints in this regard". 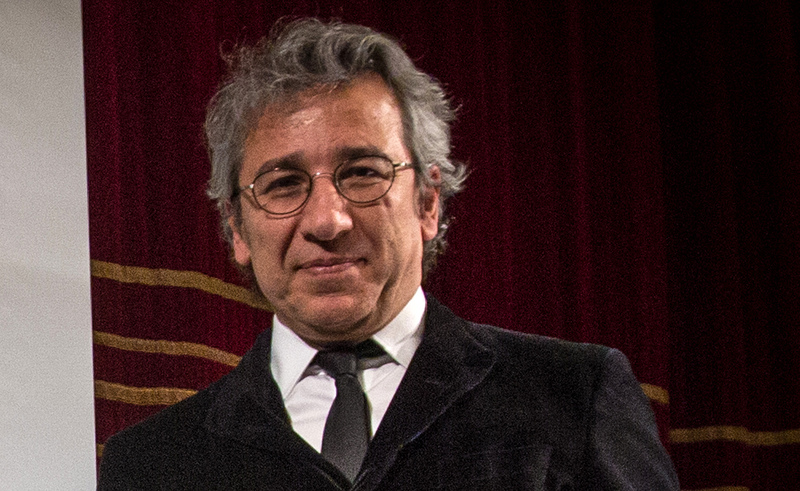 "We are all responsible", says Dündar, who sees division as the main obstacle to the creation of an effective political opposition: "We need a common democratic front that includes all those who care about democracy in the country: Kurds, Alevis, the LGBT movement, trade unions, academics, universities, the press – all together determined to oppose this fascist project. Otherwise, he will take us out, one by one". "None of us had expected mass demonstrations of this magnitude three years ago", he says referring to the millions of people taking the streets in summer 2013. "Surprising everyone, people took to the streets, and this happens when the harassment of the society becomes untenable; then you never know what can happen. If I expect another Gezi? Yes, I do hope so".